November 2009 – Diane Y. Probably layering with lovely papers but I love trying new techniques and often use one over and over. But then I go back to layers! There are too many to list; I have more than 3000 stamps…so far! stamp positioner so I can put the image right where I want it. 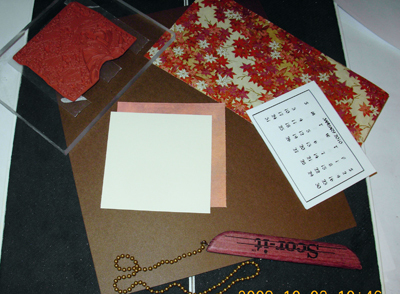 It depends on the card – I use ribbons, brads, charms, mizuhiki cords, etc., etc., etc…. tool you couldn’t live without? Ask this group any questions and you will get lots of helpful answers. OSA, why do you like stamping in the Oriental theme? lists or local clubs do you belong to? magazines? If yes, please list. I enjoy walking, reading, baking and cooking really healthy vegetarian foods. I find inspiration in the artist galleries online as well as magazines, books, and the artwork you see everywhere including advertising, nature, fabric designs…well, basically the whole world! No formal training but I’ve tried a lot of crafts and this is the one that never seems to get boring. unusual item in your stamping that wasn’t necessarily meant for stamping? What?? Isn’t everything meant for stamping? Well, OSA member galleries are a very rich resource! In the past year I’ve been exploring a lot of blogs as well. Too many to list!! job when you’re not stamping? family and where you live. I live with my dear, dear husband of 46 years. We have 3 grown children and 3 granddaughters. We live in paradise, also know as Victoria, BC, Canada. You will also need a piece of fairly heavy cardstock, 8 1/2″ x 10″, a nice stamped image and a mat for it, and a piece of decorative paper 8 1/4″ x 4 1/4″. Score the cardstock along the long side at 4 1/2, 5 1/2, 6 1/2 and 9 1/2″. 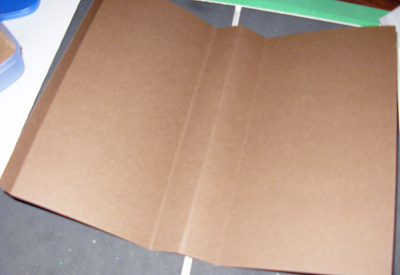 Fold as shown in photo. 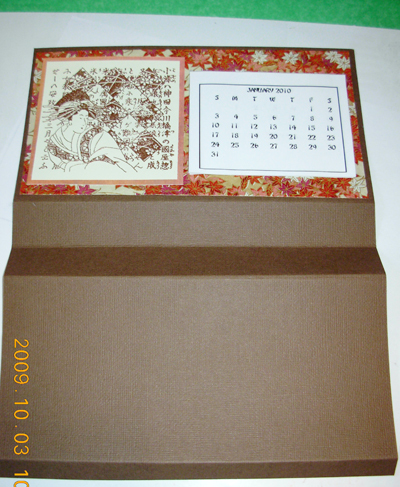 The 4 1/2″ x 8 1/2″ side is where you attach the stamped image and calendar. You’ll notice that it’s bigger than the other side; that is so it will be slightly tilted for stability when it’s assembled. 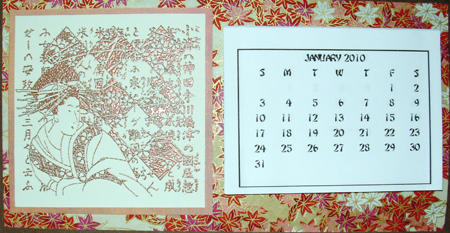 So, you’re nearly finished: attach the decorative paper, the stamped image and the calendar. 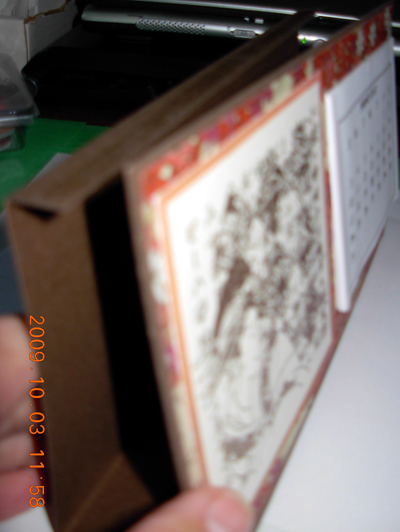 Then run glue or tape along the smallest scored edge and attach to the back of the decorated side. Easy!